Struggle Of Power—The 4th Governor of Mafia! In August, Mafia City will experience The 4th Governor of Mafia; a war for the Ultimate Power known to any tyrant, a Power that can devastate, empower the world. City 1-196 will officially be assigned to 8 states this time, in which each state will consist of different Cities. Divided by the geographic boundaries, no City will desire to blow towards the other. *-2-* Battle Rule: The battle will consider Clan as a unit, in which clans from various Cities will enter the Governor of Mafia’s Map to begin battle. The battle will last for 8 hours, during which the player who occupies the Governor’s Office the longest will become the Governor when the event ended. Unlike the Mayor Election, occupying time can be stacked. Also, killing crews will be awarded with Battle Points, in which rewards will be given according to the ranking after the battle has ended. There will also be Resource Tiles in the battlefield that players can gather from! 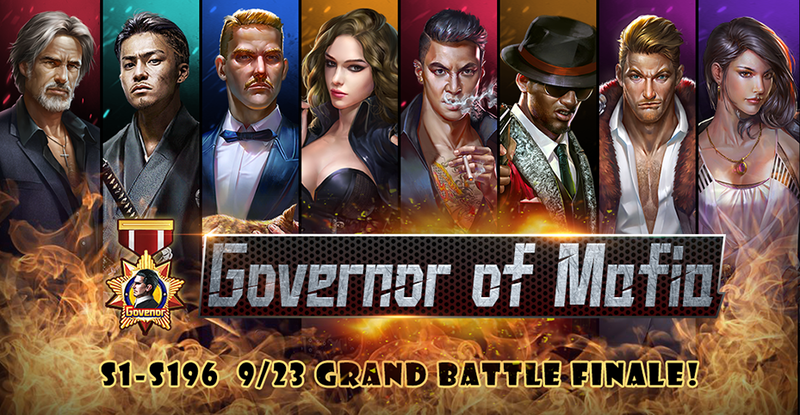 *-3-* At the same time, Loss Crew in the Governor of Mafia event will be sent to the First Aid Center (626,575). The First Aid Center will be opened for 3 days after the Governor of Mafia event has ended, leaders can use that time to revive their Loss Crew by usage of “Medical Certification”. Governor’s Benefit: Can appoint 8 powerful Officials, obtains exclusive buff and etc., details can be viewed at the event interface. After the Governor battle has ended, all cities will enter a state of temporary truce till the next Governor of Mafia event; which is 28 days later. The 2nd Governor of Mafia Event Has Officially Ended! Full burst! Vigilante Equipment Set is coming! The 3rd Governor of Mafia Event Has Officially Ended ! Interview with Bosses about Governor of Mafia!